If you are searching for a new mattress you will have to make a decision about whether or not you like a soft or firm mattress. There are advantages and disadvantages to both styles, but what the decision really comes down to is personal preference. According to WebMD there is a significant factor, which mattresses effect, that disrupts sleep. The capillaries, under the skin, that carry blood to the surface of your body, become restricted when pressure is applied to your skin for an extended period of time. When this restriction occurs, nerves send pain signals to the brain that cause you to roll over. Each time this occurs, your sleep is momentarily interrupted. You may not notice this during the night, but continually interrupted sleep can make you feel tired during the day. WebMD suggests that something in between a firm and soft mattress is the best. This will prevent you from cutting off blood flow throughout your body, as well as prevent putting extra pressure on joints, while still providing support for your body. An intermediate or a firm mattress with a pillow top is most likely ideal. The best way to determine what is right for you is to evaluate your level of satisfaction with your current mattress. Decide if you want something similar or something firmer or softer. If you are unsure, spend a lot of time shopping around. Don’t buy something the first time you go out. Spend an extended amount of time on each type of mattress. A good salesperson will let you take your time and make an informed decision. If you share a bed and you cannot agree on the level of firmness, there are a few options. There are spring mattresses available that offer one firm side and one soft side. You may also want to consider memory foam, such as Tempur-Pedic. Adjustable air mattress style beds, such as Sleep Number, with split sides are also available. The most important thing to remember is that a mattress is a long term investment that can effect your overall physical and mental health. Make sure you take the time to get the mattress that will keep you resting comfortably every night for years to come. November 23, 2012 | Posted by Lee C.
Do you wake up groggy every morning or with a sense of stressed panic? Do you hit the snooze button over and over, only to be woken by harsh beeping, again and again? Your alarm clock may be the culprit of these habits and feelings. Waking to a harsh beeping in a very dark room is unnatural and difficult on the body. But, if you have to wake up at a specific time, you have no choice but to use an alarm clock. Fortunately, there are alternatives to the old, noxious beeping. And, methods for breaking the snooze button pressing habit. One alternative to the standard beeping alarm clock, is the sunrise alarm clock. There are various models of the sunrise alarm clock available on the market. Typically, these alarm clocks use LED lights to gradually increase the amount of light in your room. This mimics a natural sunrise. Ideally, when the light increases to its maximum, your body will naturally wake to a well lit room. Most of these alarm clocks also allow you to combine the light with another form of sound to wake you such as the radio, nature sounds or even beeping, if you choose. Many clocks have settings that allow you to use the light as a reading light or night light. These clocks are effective because our bodies naturally produce a hormone called melatonin to help manage our sleep cycles. This article from WebMD describes how light may play a significant role in melatonin production. Typically, melatonin levels rise as it gets darker in the evening and decrease in the morning. However, if your room does not allow light in, your body will not respond to increasing light levels in the morning. A sunrise alarm clock may help lower levels of melatonin before you wake, helping your body have a longer, more natural entrance into the day. Many alarms also have a sunset feature that mimics a natural sunset, helping you gently fall asleep at night. You are also less likely to hit the snooze button if your room is already bright. The bright light and natural arousal of your body will make it difficult to go back to sleep. This will help you get up and moving right away. Setting the clock walking distance from the bed will also encourage you to get out of bed right away and skip the snooze button routine. Sunrise alarm clocks have various features and settings. Some include sleep aids, such as white noise, as well. When you are shopping for a new alarm clock, make sure it has all of the features you want, and that it can be set to make noise, if you need it. Nextag has an extensive list of sunrise alarm clocks with reviews and sellers. If your day starts out with stress, try a new approach! 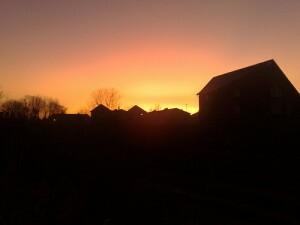 A sunrise alarm clock could improve your mood and stress level throughout the day. Depending on your age, daily calorie intake, size, gender and level of daily physical activity, Cooking Light recommends people eat between 2.5 and 4 cups of vegetables a day. It may be difficult to squeeze in that many vegetables every day, especially if they are not your favorite foods. But there are some ways you can add more veggies to your diet and make them taste delicious. One way, is to add vegetables to your breakfast. Eating breakfast is a healthy habit, and a good way to get in extra servings of fruit and vegetables. The following are a few surprising recipes, as well as old breakfast ideas you may have overlooked. Carrots make great cakes, so it makes sense that they would also make great pancakes. These pancakes taste delicious with a cream cheese topping or simply with maple syrup. This is also a great way to sneak vegetables into kid’s meals without them noticing. The pancakes are so good they will have no idea they are getting a serving of vegetables with breakfast. This recipe can be found at The Food Network. If you love eggs, they are a great platform for vegetables. Try stuffing an omelet with sautéed eggplant, and peppers. Add diced tomatoes or feta and spinach to your scrambled eggs. 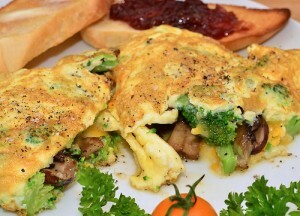 Many people already eat eggs for breakfast, it is an easy next step to add a serving a vegetables. Pumpkin is an excellent addition to the classic breakfast scone. The aromatic spices and mildly sweet flavors in the scone make it an excellent compliment to a morning cup of coffee. This recipe, from the Joy of Baking, suggests adding raisins, but dried cranberries also work well. Quick breads are another great breakfast item. They can easily be prepared ahead of time and then eaten throughout the week. Zucchini is a great alternative to the traditional banana bread and will help make a green vegetable very easy to swallow. Zucchini bread is particularly helpful when summer gardens overflow with the squash and you are out of ideas for preparing it. This recipe from the Food Network makes two loaves, so you can eat one now and freeze one for later. Eating more vegetables, especially vegetables fro breakfast will help you have more energy throughout the entire day. This is just one healthy habit that can help you feel better both physically and mentally. Do you have a favorite breakfast vegetable recipe to share? November 15, 2012 | Posted by Lee C.
Traditionally, bedroom furniture has come in matching sets, neat wooden head and foot boards that match neat wooden dressers, bed tables and armoires. Lately, the trend is shifting. Bedroom pieces no longer have to match to be stylish and headboards do not have to be made from wood. There are a variety of unique headboard ideas that can add character to your bedroom. One option is to go without a headboard. A boldly painted wall, or a pretty painted design can easily take the place of a headboard. 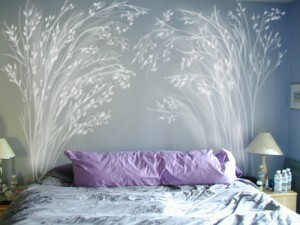 You can also place a favorite, large work of art over the bed as an alternate to a headboard. The painted design in this picture creates the illusion of a beautiful headboard, without having one at all. Another inexpensive option for a headboard is one made from materials found in flea markets, thrift stores, antique shops or even burn piles. 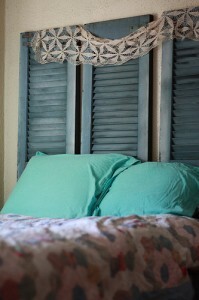 Old doors, shutters, barn windows, even vintage signs can make beautiful country looking backdrops for a bed. 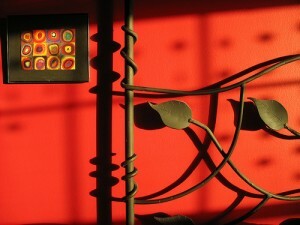 HGTV.com features several examples of these types of headboards. You can also repurpose the headboard you already have. There are several methods for creating slipcovers that can give your old headboard a new look. A few yards of material can transform you bedroom. HGTV.com gives instructions for how to sew a slipcover for a headboard. DIY Network also offers instructions for making a cloth headboard with a plywood back. When shopping for a new headboard, consider what style and ambience you want to have in your room. Make sure the headboard you choose promotes that ambience. For example, consider wicker for a country room, or thatch for an airy, beach-like room. 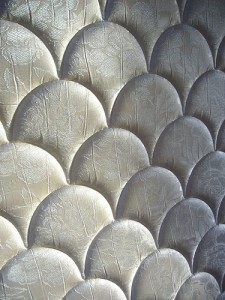 Metal can create a modern or industrial look. Wrought iron can create a classic, formal look. Mirrors can also inspire a formal or modern look, depending on how they are used. The new rule in bedroom fashion is there are no rules. The more you think outside the box, the more unique and beautiful your bedroom will be. You can easily change your bedroom decor without spending too much money. A little work and a lot of creativity can result in a bedroom that you can enjoy and show off! Mattresses are expensive, difficult to move, and hard to get rid of. These are all reasons why you may be dreading replacing an uncomfortable mattress. Not to mention haggling with sales people and spending days shopping around for the perfect, comfortable mattress. It can be as difficult as purchasing a new car! If your mattress is uncomfortable either because it is getting old or it simply wasn’t very comfortable in the first place, there are a few things you can try in order to revitalize it, before giving in and buying a new one. First, try turning your mattress. If you have a spring style mattress, natural wear will cause sags from sleeping in the same place over time. To avoid this, Apartment Therapy suggests flipping your mattress four times a year, alternating between end over end and side over side. This will help your mattress last longer and be more supportive and comfortable. This does not apply to memory foam or air bed type mattresses. If turning your mattress is not helping, consider buying a mattress topper. The mattress topper will give you a new, pillow top feel, without having to buy a new pillow top mattress. There are several different types of mattress toppers. If you don’t have any problems with allergies, you may want to consider a feather and down mattress topper. These toppers are very soft and will relieve some of the pressure points you may have been feeling on your old mattress. 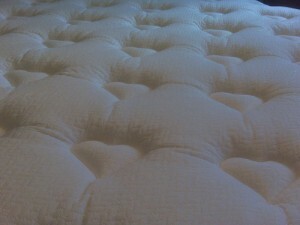 If you have allergies, there are also mattress toppers that have synthetic fill, such as polyester. These toppers are hypoallergenic and work just as well as down and feathers. If you want the soft comfort of a feather bed, a mattress topper will provide it without having to buy a whole new bed. Most mattresses, if cared for properly, will last at least 10 years. After your efforts to revitalize your mattress, if it is still uncomfortable, or you feel like there is absolutely no life left in it, you may have to purchase a new one. Before you do, be sure to read this post on Tempur-pedic mattresses. A new type of mattress may be what you need for a good night’s sleep and joint pain relief. November 10, 2012 | Posted by Lee C.
Last Sunday most people in the United States set their clocks back one hour, “falling back” to standard time. For many, the extra hour of sleep was very welcome. But where does this tradition come from? According to National Geographic, up until 1918 there was no official standardized time, or time zones in the United States. Each municipality was allowed to set their own time. What complicated things was the railroad. It was difficult to maintain an effective schedule when every stop had a different time. In 1883 the railroad industry created uniform time zones, but they were not federally mandated until 1918. Daylight Saving Time was first practiced as an energy saving effort for WWI and WWII, however, the time changes were also regulated locally. It was the Department of Transportation that oversaw the federally regulated observance of Daylight Saving Time in 1966. Today there is still no federal mandate that all states are required to observe Daylight Saving Time; Arizona, Hawaii and many US territories don’t. But, it is required that if a state does use Daylight Saving Time, it must begin at 2:00 am the second Sunday in March and end at 2:00 am the first Sunday in November. Daylight Saving Time was extended in 2007 by four weeks with the intention of saving energy. ABC reported that in 2008 “U.S. electricity use decreased by 0.5 percent per day, which added up to 1.3 billion kilowatt-hours — enough to power about 122,000 average U.S. homes for a year.” National Geographic reports that other benefits of extending daylight may include reduced traffic accidents, more people being active outdoors, increased use of public space such as parks, and less crime. The benefit of ending Daylight Saving Time this week was an extra hour of sleep for you! You can enjoy your warm bed a little longer on a chilly November night. It may take your family a little bit of time to adjust to the new time, but you can enjoy getting up in the morning with a little more light. Consider taking an hour this week to celebrate the end of Daylight Saving Time. Do something you haven’t had time for in awhile, spend extra time with your family, enjoy a big breakfast or take a nap. How do you adjust to Daylight Saving Time? Down is a type of feather that is found on most waterfowl. It is the layer between the outside feathers and the bird’s body. Down has the important function of keeping the bird’s body warm. It does this by insulating the bird’s body from the outside temperature. The light fluffy feathers create many tiny air pockets. The outside temperature is prevented from reaching the water fowl because it cannot move easily through the many air pockets. There are a number of characteristics that make down very useful to humans. The first is its insulating properties. Down, when placed in a coat or a comforter, has the same insulating capabilities that it does on a goose. It keeps warm air trapped near the body and cold air out. Down is also very soft. 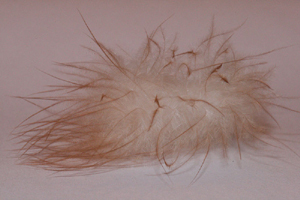 It is a simple feather that looks like a puffy cluster. These feathers are without barbs and have only a very small rachis or shaft. Because all of the air pockets found in the feathers, down is light and compressible which is ideal for camping gear, such as sleeping bags and jackets. One drawback of down is that it loses its insulating capabilities when soaking wet. Wool is much better at insulating when soggy than down. Two ways of measuring the amount and quality of down in products are the fill power and the fill volume. Fill power is measured by a weight pressing compacting the down in a very climate controlled cylinder. It is measured in cubic inches per once. Medium quality down is around 400 and anything over 750 is very high quality. In these high fill power products the clusters of down are larger, giving them the ability to insulate to lower temperatures while remaining lighter and fluffier. This number is especially important for camping products, where weight is a significant advantage. For items such as comforters, fill power is not as significant. Fill volume is how much volume is used by one once of down. This number is rarely used to advertise down products, but it is important not to confuse it for fill power. One disadvantage of down is that it may cause problems for those that suffer with allergies. Very few people are allergic to the goose down itself. However, the structure of down naturally gathers dust mites and other allergens. Fortunately, there are alternatives. There are many synthetic fibers that closely imitate down and are just as fluffy and warm. There are also hypoallergenic down products in which the down is cleaned and and the product constructed in a way that can prevent allergens from collecting in the fine feathers. If you are searching for light, fluffy and warm, whether it is a coat, comforter or sleeping bag, down is an excellent choice. Sleep is important for a number of reasons. Good health is what most often comes to mind, but sleep may go beyond helping you feel good. A good night’s rest or a nap may help you retain memories. Some studies are showing that learned information is solidified in your brain while you sleep. You may have heard of programs that help people learn a new language or other new information in their sleep. These programs usually require playing recordings of the information while you sleep. Unfortunately, it is not likely that your brain can absorb new information while you sleep, but sleeping can help you remember things you have learned during the day. So, when you learn something new, the research seems to show that you will greatly benefit from a nap or a night of sleep. If you have an exam or big presentation, pulling an all-nighter to prepare, instead of sleeping, may hurt more than it will help. Your brain will be better able to recall learned material, regardless of the day’s other interruptions, after a full night of sleep. All the more reason to get the best night of rest possible! 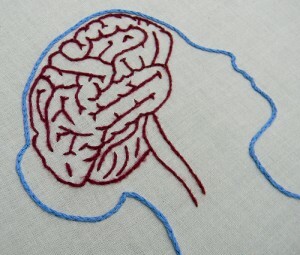 Photo “Female Anatomy Brain and Lung Embroidery Hoop Art” courtesy of spectacles.